Har har, that’s not really true. But if your name is Cadan or Quinn, and if you have a Korean uncle, and if you were born before May 22, 2012, and if you’re wondering why you never got a mention on LIK before today… well sorry, I just wasn’t bored enough when you guys were born! Teehee. Matilda, if this page isn’t #1 soon in Google’s search results for your name I’m gonna be pretty mad… and if it STILL isn’t #1 by June 2030 or whenever you graduate high school, I’ll make it up to you by getting you a kickass graduation present which you will probably think is incredibly stupid! Yeah, it’s gonna be more crappy coins. Sorry for ruining the surprise. 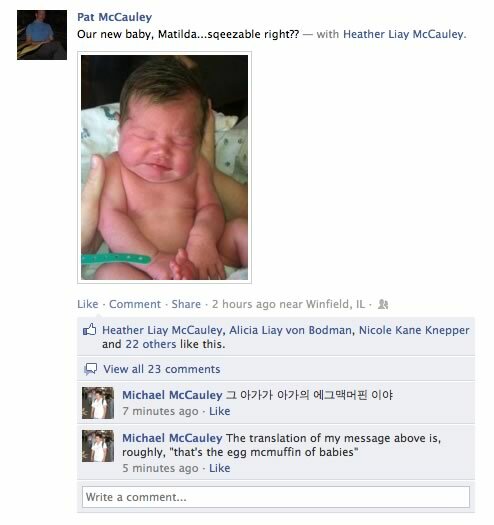 I've literally been waiting months to call Matilda "The Egg McMuffin of Babies"